Logicomicx: An Epic Search for Truth by Apostolos Doxiadis and Christos H. Papadimitriou is a fictionalised biography of mathematician and philosopher Bertrand Russell that particularly emphasises his quest to establish the logical foundation of mathematics. 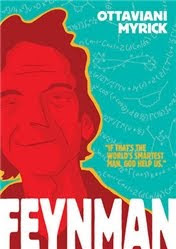 Jim Ottaviani and Leland Myrick’s Feynman is also a biography of a giant of twentieth-century science – as the title tells us, the Nobel Prize winning physicist Richard Feynman. Although at first glance the two books may sound similar, their structures and approaches to their subject matters are in fact very different: while Feynman is a pretty straightforward biography (though no less interesting for that), Logicomix is more ambitious and complex. The story of Russell’s life – from his unusual upbringing in his grandparents’ house to his obsession with his work on Principia Mathematica, his relationship with Wittgenstein, and his pacifism – is narrated by an older version of Russell himself, who’s giving a lecture in an American university at the beginning of WW2. The topic of the lecture is the role of logic in human affairs, and the audience is partially made out of anti-war activists who expect Russell to take a stance against the war. They demand that he explain how logic could possibly justify a global conflict like WW2 – but as the story Russell is about to tell illustrates, the subject is far more complex than it may initially seem. Russell’s life story is intermingled with self-referential sections where the creators of Logicomix (the two writers plus artists Alecos Papadatos and Annie Di Donna) discuss their thematic choices and comment on the narrative itself. This metafictional approach gives them the opportunity to highlight some of the ideas Logicomix grapples with in a way that doesn’t feel heavy-handed. Moreover, it adds an element of humour to the narrative. 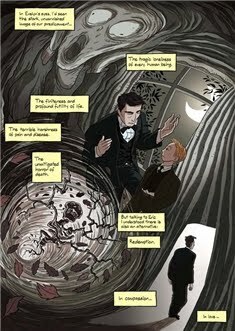 I was particularly interested in the discussion of the link Logicomix establishes between Bertrand Russell’s brilliance and his history of mental illness. The genius-and-madness-are-linked trope is not one I’m usually very comfortable with, but I appreciated how the self-aware framing of the narrative allowed the creators to acknowledge its problematic side. More than suggesting a consistent link and idealising mental illness in the process, what Logicomix does in the end is explore the difficult personal circumstances that may have fuelled Russell’s obsession. 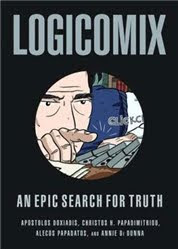 The subtitle of Logicomix is “An Epic Search for Truth”, and indeed another one of the book’s main themes is Russell’s interest in, and evolving understanding of, the idea of absolute truth. As a young man, Russell was drawn to the uncomplicated certainty of pure logic, and as he matured as a philosopher he struggled with the tension between that certainty and the messiness of life. The process of becoming a better philosopher, however, required him to accept the roles that uncertainty and unpredictability play in human affairs. 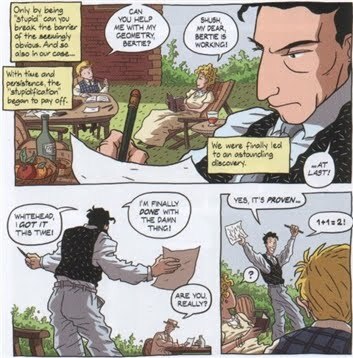 What I liked the most about Logicomix is how well it illustrated the link between a philosophical quest such as Russell’s and the whole business of being human – Bertrand Russell’s quest for truth is as much personal and emotional as it is purely intellectual. As I said above, the structure of Feynman is far more straightforward, and unlike Logicomix this is not a biography that takes many liberties with the facts. Anyone who has read about Feynman before will recognise the main events portrayed in this book. Not only that, but Feynman does an impeccable job of capturing its subject’s voice accurately – I’ve read excerpts from Surely You’re Joking, Mr. Feynman! and What Do You Care What Other People Think? in the past, and the Feynman I saw there was the exact same Feynman I saw in this book. Feynman is a great introduction to the famous physicist’s life and ideas. In addition, the book includes a very useful annotated bibliography at the end that gives anyone interested in learning more about Feynman an idea of where to go next. 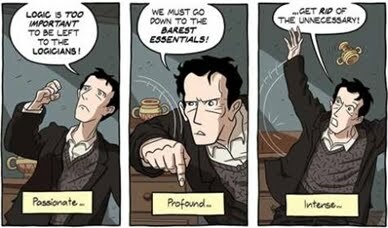 Both Feynman and Logicomix are excellent reads, but while Feynman does a good job of demystifying genius by showing us its subject’s human side, I’m not sure Logicomix achieves the same effect. However, it does take an interesting look at the personal circumstances behind Russell’s obsession. More than anything else, I found both books valuable because they capture the excitement of discovery, of knowledge, of research, and they do a great job of presenting complex scientific and philosophical ideas in an accessible way. Last year I taught Logicomix in my Intro to Lit class! I loved the layers of narrative and what each contributed to the others. 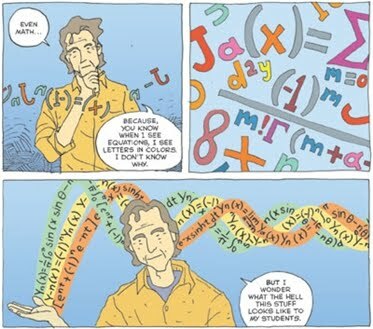 This is a case in which I think the graphic novel does a disservice, because Feynman's own autobiographical books are so charming and understandable and have all the same info but with his personality and sense of humor added. Trisha: What a great choice! It must have been so much fun to teach it. Jill: To me the advantage of the graphic novel is that it could introduce Feynman to people who might not pick up his books because they find them intimidating or worry they wouldn't "get" them (I'm thinking teenagers here, but not necessarily just them). I don't think anyone will read this graphic novel *instead* of Feynman's books - it gives you just a glimpse of his life and work, and if you're truly interested you'll want to know more. But people who might not come across Feynman otherwise could very well pick it up, and who knows? It could be the start of an exciting journey for them. Both books look great Ana. I often used introductory comic books breaking down difficult science and philosophy when I was studying. It's a great way to get to grips with some complex ideas and provide a springboard to more in depth books. I'll definitely be checking these out. I read both books and really enjoyed them. You're right about Feyman's book - if you're a first-time reader, you're going to want to read everything else he's penned. One of my favorite scenes from the book is when Feyman is encouraging his sister to do harder math by telling her to read a certain textbook over and over again until she understands it. Plus, she eventually becomes a mathematician herself. For Logicomic, I think the illustrators did a great job with the madness/genius trope. Normal people understand that life can be so messy but it's funny how many of the philosophers in the book couldn't understand that and tried to beat life down with logic like Russell and his unhappy marriage to one of his wives and the philosopher who sent his son to an asylum because of his mental problems. Thanks for highlighting both books. These both definitely look like they're worth a look. I don't often look at graphic novels, but these have piqued my interest. Also, I've read some of Feynman's books, and I'd agree with Jill that they're very accessible, and really enjoyable reads for lots of different types of readers. However, I think there's something to be said for graphical representations of things. I'm partly thinking of The Way Things Work, and how fascinated I was by that book as a kid, as young as 5 or 6, I think. I wonder if this graphic novel would be something that would be appealing or appropriate for younger audiences. Not necessarily 6, but what about younger than say, 12 or 13? Sounds like pretty heavy stuff for graphic novels. Vasilly: I loved that as well - Feynman never assumed that his sister just "couldn't" get it and instead encouraged her to keep trying at her own pace. 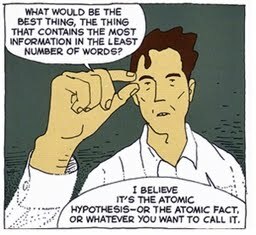 And I agree that Logicomix dealt with the genius and madness trope far better than most books. Neal: Yes, I think the book would work for that age group. I agree with you and Jill completely about how accessible Feynman's books are, but sometimes the perception of accessibility actually matters more. The books may be perceived as intimidating even though they're not really, and maybe the GN could contribute to taking down that barrier. Kathy: I see graphic novels as a medium just like any other, so to me there aren't any subjects that are too heavy or complicated for them to tackle, just like there aren't subject that aren't fit for text-only books, documentaries, etc. It's what you do with the medium that counts. Okay how much do I even love Russel("l" obviously not that much since I only wanted to give him One L)? But srsly I am a fanatic with Logicomix and rec'd it to almost anyone, whether they read or not. I found it so intellectually available. It was so far from the **I'm sooo smart and you will sound smart having read me** comic. Rather it was just plain cool. And also, I'm adding the other one to my library search. Wonderful review, Ana! I read 'Logicomix' when it came out and liked it very much. (In case you are interested you can find my review here.) I liked the way it combined memoir with anti-war protests with the history of mathematics and Greek theatre. I loved what you said about the metafictional approach that the authors had taken in the book. I loved that aspect of the book very much. Because you love Richard Feynman so much, I would recommend one thing. There is a book called 'Richard Feynman's Lectures in Physics' which came out in three volumes. It is a compilation of physics lectures that Feynman gave in Caltech for three consecutive years. The introduction to the book and the first chapter in the first volume of the book are wonderful. They are not technical and they are accessible to a general audience. I would highly recommend that first chapter. Hope you get to read it sometime. Christina: I agree completely - it was complex but acessible; smart but not clever just for the sake of beinf clever. And most of all it had real heart. Aarti: Yes, he really seems to! I already knew a fair bit about Feynman going in, so sadly I have no idea whether this book would provide enough context for someone without that background knowledge. 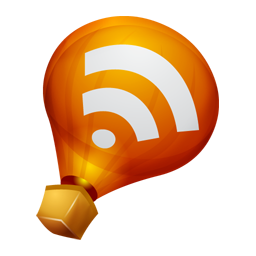 Vishy: So sorry I missed your excellent review - but I have now added the link! And thank you so much for the Feynman recommendation. I've often wondered whether his physics stuff would go over my head, since I lack a solid grounding on the subject, but by the sound of it I shouldn't worry.